ANDREWS — Could your backyard be the new home to a nuclear waste site? Andrews is waiting to be licensed as a temporary holding site for radioactive waste. Tom "Smitty" Smith, director of the Public Citizen’s Texas office spoke to the concerns of bringing a high-level radioactive site in west Texas in a meeting Thursday. According to Waste Control Specialist, "it’ll bring in somewhere around 40 or 50 new jobs and normally these are fairly high paying jobs," Vice President, Tom Jones said, "right now there’s already over 100 places around the county that this stuff is already being stored." 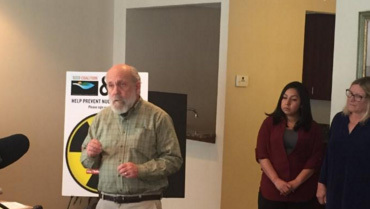 "Putting high level radioactive waste out in west Texas is a really bad idea," non-profit group Public Citizen director Tom "Smitty" Smith said. Both sides are going head-to-head about a proposed nuclear disposal site 30 miles west of Andrews. It’s an idea that lifelong resident of west Texas and mother, Delilah Cantu, is concerned about, "this is my home. This is what I want to protect." "WCS promises this is going to be a temporary sight but that depends on congress ever being responsible enough to ever create a long term repository," "Smitty" Smith said. WCS the government will immediately take over the waste project but there’s no telling how many decades the plant will be in west Texas, "I think folks are scared of the unknown. This is material people have been dealing with for the last 50 or 60 years," Jones said, but that doesn’t ease Cantu’s worries her concerns keep growing like this one, "the remapping of the aquifer in Andrews," Cantu said. According to WCS, Andrews is not on top of an aquifer, "we’ve had 640 borings out there. We’ve got over 400 wells dry. We can prove we are. It over a drinking source." Visit NoNuclearWasteAqui.org and WCSTexas.com for more information.